The Hutchinson Grain Pump is the most versatile grain handling system in the market today. Increase your versatility and provide expansion capabilities at the same time with your storage system. The grain system design around the Hutchinson Grain Pump lets you move product with gentle efficiency and at high capacities requiring less horsepower and causing less damage to grain. Hutchinson’s unique UHMW paddle keeps grain flowing gently and evenly from inlet to discharge, taking the place of traditional auger flighting. The closed loop grain system design offers the versatility to create a complete load-in/load-out system with re-circulation capabilities. 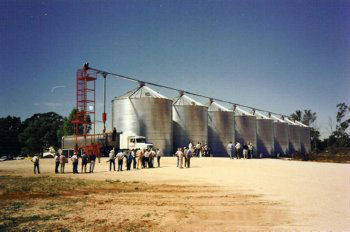 The Grain Pump can be designed into a plan underneath a row of bins or in an existing in-line system. Available in 6″, 8″, 10″, 12, and 16″ diameters. From family farm to commercial operations, this arrangement will handle any size operation with ease. Our experienced team will work directly with you to analyze the scope of your requirements and assist you using our experience in grain flow concepts to provide ideas and layout options tailored to your operation. Once we have fully assessed your requirements, we are then able to provide a quotation including any or all of the required materials, labour and equipment. Our ability to provide complete quotes works in your favour, as we source and coordinate all the necessary components to the system in one simple package. We deal with only top quality suppliers for our projects. If you are considering the addition of a grain handling system or an update to an existing one, please contact us. (a) – Clean dry non-abrasive grain. (b) – 81X HH optional for heavier usage.